Blue and Yellow – we have those colors on ribbons, websites, T-shirts, Cushing’s Awareness Challenge logos and even cars. 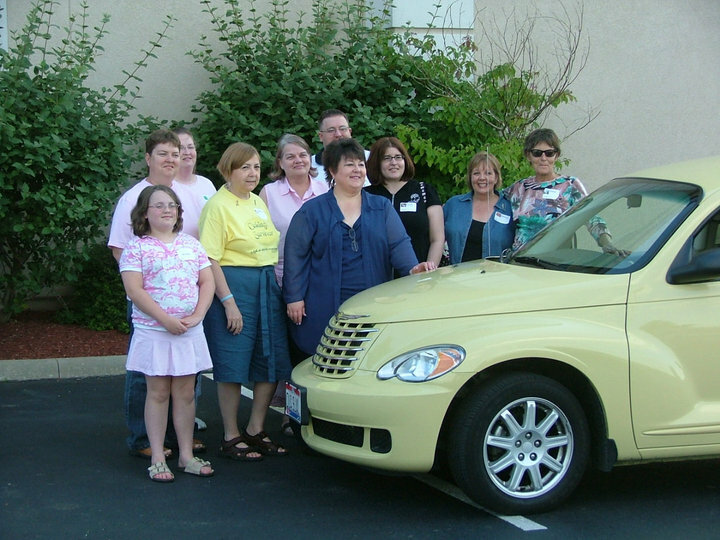 This is the yellow PT cruiser I had rented for the Columbus, OH meeting in 2007. I didn’t ask for yellow. That’s just what the rental company gave me. Somehow, they knew. This meeting is the one when we all met at Hoggy’s for dinner although some of us travelers stayed at this hotel. I’m the one in yellow and blue. 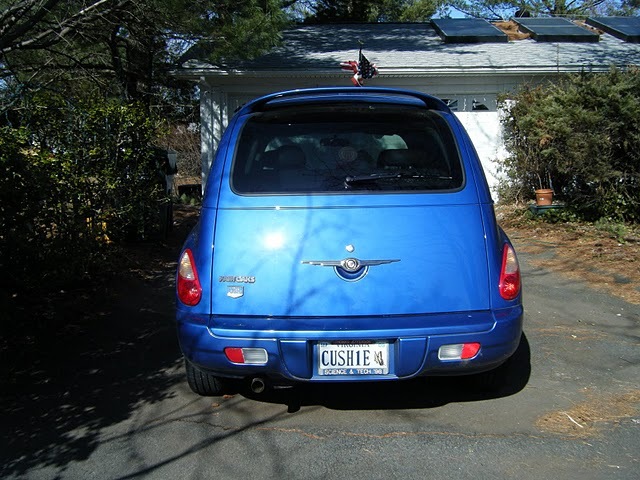 Later in 2007, I bought my own truly Cushie Car. I even managed to get a butterfly on the tags. So, where did all this blue and yellow come from, anyway? The answer is so easy and without any thought that it will amaze you! In July of 2000, I was talking with my dear friend Alice, who ran a wonderful menopause site, Power Surge. We wondered why there weren’t many support groups online (OR off!) for Cushing’s and I wondered if I could start one myself and we decided that maybe I could. This website (http://www.cushings-help.com) first went “live” July 21, 2000. It was a one-page bit of information about Cushing’s. Nothing fancy. No message boards, no blogs, no wiki, no image galleries… Certainly no Cushing’s Awareness Challenges. I didn’t know much about HTML (yet!) but I knew a little from what Alice had taught me and I used on my music studio site. I didn’t want to put as much work <COUGH!> into the Cushing’s site as I had on the music studio site so I used a now-defunct WYSIWYG (What You See Is What You Get) web editor called Microsoft FrontPage. One of their standard templates was – you guessed it! – blue and yellow. TaDa! Instant Cushie color scheme forever. Turns out that the HTML that this software churned out was really awful and had to be entirely redone as the site grew. But the colors stuck. Now, in this day of mobile web browsers and people going online on their cellphones, the website is being redone yet again. But the colors are still, and always, blue and yellow. In July of 2000, I was talking with my dear friend Alice, who ran a wonderful menopause site, Power Surge. We wondering why there weren’t many support groups online (OR off!) for Cushing’s and I wondered if I could start one myself and we decided that maybe I could. I didn’t know much about HTML (yet!) but I knew a little from what Alice had taught me and I used on my music studio site. I didn’t want to put as much work <COUGH!> into the Cushing’s site as I had on the music studio site so I used a now defunct WYSIWYG (What You See Is What You Get) web editor called Microsoft FrontPage. Welcome to our #DanceOff challenge video! This kid really knows how to dance, hmm?!? I give thanks for all of you daily as I have hope now that persistence will pay off and I'll have a diagnosis soon, and I wouldn't have ever been able to have that hope without this site! Thank you MaryO!! Listen as Robin Smith (staticnrg) and Mary O’Connor (MaryO) co-host Cushing’s message board members calling in to talk about their fight for diagnosis and treatment. The show will be opened with a brief explanation of what Cushing’s is and what the symptoms are.